The temperatures in the northern regions of the sub continent continue to be around 2-4c above the normal. Nawabshah in Pakistan at 43c, 2 days ago and Akola at 41c are the highs of the region. But the dipping low aloft from the Afghanistan region will bring in 2 W.D.s in the first week of April, but rain maybe restricted to the northern areas only. By the 15th. 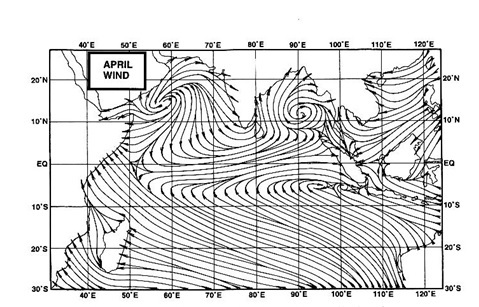 April, normally the pre monsoon stage must set in, with the preparation for the formation of the monsoon low over the northern regions of India begining to start. With the MSL in the region today at 1006mb, and the W.D.s still hovering around the plains of the north, the initial formation of the seasonal low could go into the 3rd. week of April. May not be a cause of worry for the monsoon if the W.D.s are pushed northwards after the first week and a heat wave with temperatures about 4-5c above normal occurs. Even the bay region today is still below normal temperature wise. Central bay was today at 25c, and the rest of the areas around 27-29c, while this is a bit on the lower side, and may delay the formation of the first pre monsoon low in the bay, which normally appears by the 15th., the heating up of the waters will be observed in the next few weeks. There has been a big gap in your postings. Would be interesting to follow monsoon buildup and its progress...what happened to Indo-US Monsoon study ?? Never heard about it after initial publicity.